You have provide a great summary of things that honey can be used for. And for many of them, people should make use of what honey they have to hand, although the more natural (less processed) it is the better. If you have a cough or cold, use some of whatever honey you have in your cupboard already. With regard to your question about manuka honey versus a good organic honey, the first important point to make is that not all manuka honey is the same. It naturally occurs in different potency levels. Much of it is simple manuka flavoured honey, and would be no different to a good organic honey. However some of it (and only some) has been proven to contain extra antibacterial properties, in addition the the hydrogen peroxide that comes from all honeys. The additional antibacterial property is more stable, and continues to work when mixed with wound fluids etc. There is a trademarked term, ‘UMF’ (Unique Manuka Factor) that can be found on the labels of that manuka honey which contains the additional antibacterial properties, along with a potency rating, eg a UMF 20+. You can find some examples of a recognised UMF manuka honey here. One of the other drawbacks of honey – is it is sticky! If using for a wound or burn, generally you will want to place a dressing (as non-absorbent as possible) over top, simply to prevent sticky contact with clothing, furniture etc. Thank you, Ann. Bt, a biomanufactured pesticide is killing. It paralyzes the gut. It is also harmful to humans and causes muscle and brain wasting. The toxic protein cannot be encapsulated by the machrophage. It is used in 80% of the world on crops, trees etc to kill bugs. Monsanto has added other vectors with it to make it more lethal. Fight this wherever you can until the information gets to the proper sources. Read “Silent Spring” about pesticides. Rachel Carson, the author, stopped DDT. We must stop this too. 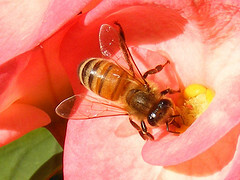 Save the Honey Bees, save the planet’s creatures and save the children. WE CAN DO IT! i have been trying to know what honey is good for. I know for a fact that honey has most vitimans but is it helpful for arterie disorders?